Has this ever happened to you? You are an attorney for the underdog, representing someone hurt by the indifference, carelessness or greed of a large institution. You are on the right side of the case. Morally and legally, you deserve to win. You believe you are scoring points with the judge and jury. The other side’s arguments are weak and disorganized. And then you lose. How did that happen? We think we have some answers, and some ways to keep it from happening again. Click to purchase. Complexity, confusion and ambiguity are insidious enemies. They creep up when you are not looking. They rarely attack head-on. They are particularly abundant and pernicious in complex cases such as insurance bad faith or medical malpractice. This is because both the facts and the jury instructions in these cases are often complex, confusing and ambiguous. But these enemies appear in simple cases too. Sometimes, complexity, confusion and ambiguity are inherent in the case; other times, they proliferate due to a conscious defense strategy of confounding the jury and judge with endless, immaterial detail. In either event, you must defeat complexity, confusion and ambiguity, or they will defeat you. In this book, we set out a technique to neutralize these three defense allies and bring clarity and focus to any case. It has helped us win worthy cases that otherwise might have been lost. 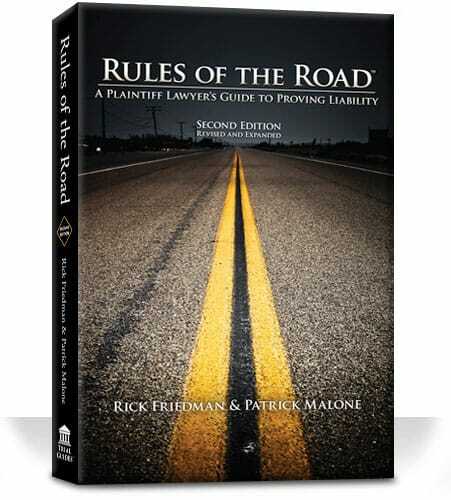 We wrote this book for our fellow attorneys who represent consumers, patients, and other real people in lawsuits to redress injustice and injury. Between us, we have more than four decades of experience preparing and trying cases. We have tasted the ashes of unfair defeat. We have also enjoyed great successes. We love our profession, and we chafe at the untruths peddled regularly these days by the rich and the powerful who don’t like it when we hold them accountable in a court of law. Every time our side loses, the other side harrumphs that another frivolous lawsuit has flamed out. Most of the time, we think the opposite is true: that frivolous defenses have triumphed because of complexity, confusion and ambiguity. Ultimately, this book is about how to breathe life into ambiguous legal standards and create an indisputable standard for everyone — judges, juries and defendants — to see. The standard must be as clear as crossing a double yellow line on a highway. The Rules of the Road technique can help focus your own thoughts and efforts, so that you can focus the thoughts and efforts of the judge and jury. It can help you work more productively and effectively — but you still have to do the hard work.